Members of the US Congress have been briefed on the plight of Northern Ireland’s Troubles victims and survivors by the most powerful Irish voice in America, Belfast Live can reveal. 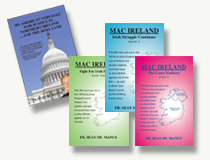 Fr Sean McManus, President of the Irish National Caucus, has sent paperwork to “key members of Congress” in Washington to examine concerns sent to him about the Stormont House Agreement. The very act by the priest from Kinawley, Co Fermanagh, has sent a warning shot to the authorities who have been backing the agreement. One source told Belfast Live: “Fr Sean McManus is a strong voice and if he chooses to use it on behalf of the victims who have sought his help, then it could be a game changer. “He has always been very vocal about the British government, coming from a country that was striven in two. 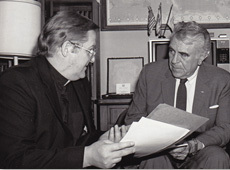 Fr Sean McManus founded the Irish National Caucus in 1977 and played a leading role in the formation of the Ad Hoc Congressional Committee for Irish Affairs. A year later he was given church permission to enter a “Special Ministry of Justice and Peace.” On December 10, 1978, he opened the office of the Irish National Caucus, the first on Capitol Hill to lobby for justice in Ireland. Now he is in possession of the issues many of Northern Ireland’s Troubles’ victims and survivors have with details of the Stormont House Agreement. And he has assured Kate Nash, whose brother was killed on Bloody Sunday, that he has given the details directly to “key members of Congress”. Each has been given a copy of the draft legislation and a scathing assessment of it written by victims’ relatives. Kate and Linda Nash’s brother William, was shot dead on Bloody Sunday and their father seriously wounded on the same day. Victims and survivors fighting for justice: Helen Deery, whose brother Manus, was killed by the British Army in 1972 along with sisters Linda and Kate Nash, whose brother William was killed during Bloody Sunday. Secretary of State Theresa Villiers the proposals do not amount to a general amnesty for those on all sides who carried out murders during the Troubles. And she said that confessors could still face prosecution if evidence comes to light from other avenues. But vital evidence is being destroyed ensuring prosecution is unlikely. Mrs Villiers confirmed that the five main political parties in the Stormont Executive- DUP, Sinn Fein, UUP, SDLP and Alliance, as well as the British and Irish Governments all agreed to these proposals last December as part of the SHA negotiations. Reference to so-called “statements of acknowledgement” has been removed but Kate Nash says the new draft still leaves victims in limbo and killers without fear of a successful prosecution. She explained: “The policy paper is deeply concerning. Firstly, there is no mechanism within the Stormont House Agreement to deal with those injured or brutalized during the Troubles. The entire process is focused on death related cases between January 1,1996 and April 10, 1998.” “The Historical Investigations Unit is expected to take on cases such as Bloody Sunday, this will mean further delays in the case. At present, the PSNI could arrest up to 56 soldiers in connection with the Bloody Sunday massacre, but haven’t done so. So, we question whether the HIU will be any different in their approach than the HET. “In July this year, the United Nations Human Rights Committee reminded the British Government of the need to ensure the HIU would be independent in particular with regard to the disclosure of information. Despite this, Theresa Villiers will have the power to veto the contents of the HIU investigation reports on the grounds of ‘national security’. “And then we have a truth recovery process which offers ‘immunity’ to those who choose to co- operate. The evidence given to this body will not be admissable in civil, criminal or coronial proceedings, unless it comes from another source or arises from an investigation.